We've created a space along the glass corridor landing for people to pin and share their images and experiences from the devastating fires impacting our community. Pin up a photo, write a note, or simply checkout what others in your community have to say. The display is yours to fill with personal experience. We hope this space brings strength to our community, allowing people to express and cope with their feelings during this difficult and unpredictable situation. If you would like us to print and pin something on the wall for you, please email: info@csfineartscenter.org and include "Waldo Canyon Fire" in the subject line. In response to the very poor air quality, we are keeping the FAC galleries open and free to the public until further notice. We invite everyone to use the FAC as a resource for staying indoor, avoiding the heat, and enjoying art 10 a.m. to 5 p.m. 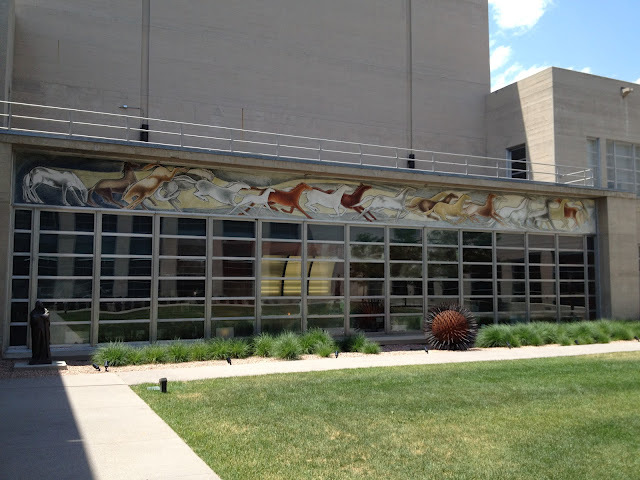 Check out with is currently on view in the museum, including Frank Mechau's Wild Horses. "unquestionably one of the greatest works of art anywhere in the state." So glad to see this! E-mailing, tweeting, liking on FB, and coming in! Thank you, Laruchka! Please do come in, and thank you for helping us share this resource with our community! Thank you for being not only a vibrant part of CS, but also an extremely caring one. I am proud to have walked your halls off and on for many years.